In India's election-bound state of Uttar Pradesh, the tigress had become an unlikely poll issue with villagers threatening to boycott suffrage unless the predator was caught. 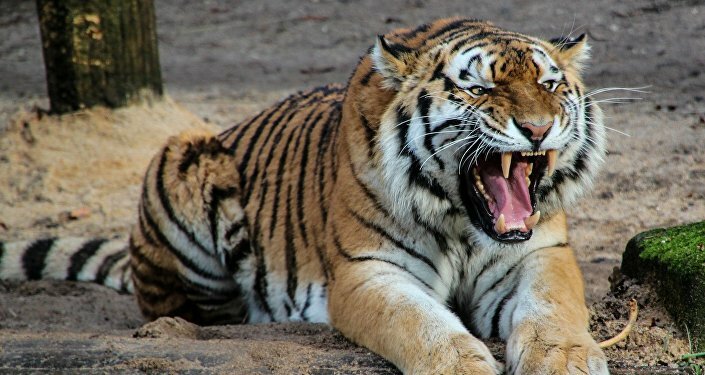 New Delhi (Sputnik) — An elusive man-eating tigress in Pilibhit district in India's northern state of Uttar Pradesh has finally been trapped by forest officials after it devoured 6 humans and injured many in a little over three months. It allegedly escaped from Indi's Pilibhit Tiger Reserve four months ago and had been prowling nearby villages for food. According to local media reports, in three months, bodies of six adult humans were found in thickets near sugarcane fields, mauled and partly eaten. The victims were mostly unsuspecting individuals sleeping on their porch during night. Despite several attempts, the forest department failed to capture it. Once, the tigress fell into the net but escaped and swiftly ran inside the jungle adjoining sugarcane fields where it hid for many days before being spotted again. Such was the terror that locals decided to boycott the ongoing state assembly elections unless the tiger was captured. Political parties traded allegations accusing each other of not doing anything concrete to capture the predator. On February 10 when the body of a night watchman was found with his head and a limb missing, infuriated locals gathered in hundreds and formed search parties carrying axe and sticks to kill the tigress. The local administration had to call in security forces and a huge team of forest officers from Lucknow to manage the hunt for the hungry feline hiding in a sugarcane field. After hours of searching, officials spotted the animal mauling the corpse of the watchman and shot it with a tranquilizing gun. As it was being pulled out, furious villagers tried to burn it alive. Officials had to brave stone pelting by the villagers while trying to rescue the tigress. "After we got to know that it had claimed its sixth victim, we began following its pugmarks and reached a place called Navadiya Sukhdaspur. The tiger put up a huge struggle. It first attacked and injured one of our 'rescue operation' elephants, Gangakali. Then we called for two more elephants to corner it. The cat fled again and hid in adjoining fields. After few hours, our men managed to shoot it with a darter, with a tranquilising gun," Principle Chief Conservator of Forests, Umendra Sharma told reporters. The tiger has been sent to Lucknow Zoo where it will be quarantined for a few days to check for infections and then released into the man-made habitat for tigers.